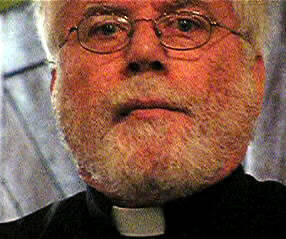 We are happy to report that the health of Fr Gerry continues to improve and he will soon be discharged from hospital. No doubt it will take him some time before he is completely restored to health. Please continue to remember him in your prayers. Fr. Dennis will be away to accompany the youth of the Archdiocese of Sydney for the World Youth Day in Cologne, Germany, from 7th of August to 25th. Please remember us in your prayers. St Vincent's parish priest, Gerry Prindiville, is seriously ill in Calvary Hospital Canberra. It is believed that he has had a pulmonary embolism (blood clot on the lung). On the afternoon of Wednesday 27 July his assistant Dennis Sudla rang from Canberra to say that Prindiville had had a "seizure" and his condition was stable. While Sudla was assuring the community that Prindiville was on the mend, he was returned to intensive care earlier this week after suffering a relapse. The Archdiocese may be assured that the St Vincent's community joins with the rest of the Church in praying for his recovery.